With heating and hot water accounting for around 62%* of a typical domestic energy bill in a year, the heating system – and how it is controlled – can have a big impact on fuel costs. Gareth Ash, Marketing and Technical Support Manager at Danfoss, goes on a mythbusting mission as he explores the latest domestic heating control solutions. As fuel costs rise, having an efficient and cost effective heating system is vital. According to the Energy Savings Trust (EST) nearly all homes in the UK have either a central heating system – a boiler and radiators – or use electric storage heaters. Trying to find ways to reduce energy bills has led to a few energy saving myths, some of which were addressed in a recent report by MoneySavingExpert.com in association with the EST and British Gas. Among the myths busted is that it is cheaper to leave the heating on low all the time. The experts were clear that having the heating on only when it is needed is, in the long run, the best way to save energy, and therefore money. This is primarily because a certain amount of energy is constantly leaking out of every home (exactly how much will depend on how good the insulation is). So leaving the heating on all day means losing energy all day. The EST also says it is best to use a timer, because the thermostat is designed to turn the heating on and off at the right time to keep the home at the set temperature. In fact, the EST recommends having as many controls as possible and claims that installing thermostatic radiator valves (TRV) and using them with the main thermostat could save up to £75 per year. For installers, that’s a strong sales argument for encouraging customers to invest in modern heating controls if they haven’t already got them. TRVs provide an important extra control that allows the temperature to be set in individual rooms, preventing energy from being wasted on heating empty rooms. The concept, as any professional installer knows, is simple but highly effective: When the temperature in a room rises above what’s set on the TRV, it will stop water flowing through that particular radiator – the boiler will still be on to heat other rooms but it will use less energy. Fitting better controls puts homeowners in charge of their energy consumption and helps them keep their homes comfortably, and perhaps most importantly, affordably warm. Whilst installers will all be familiar with the basic principles of TRVs and room thermostats, new technology is now taking heating control to the next level. The latest solutions mean that temperature can be controlled room-by-room and hour-by-hour, even when homeowners are away, for maximum efficiency and convenience. As already mentioned, the EST promotes the benefits of setting the heating to come on only when needed, and adjusting the temperature with a thermostat. However, industry research estimates that almost a quarter of homes in England are without a room thermostat to set the preferred level of comfort. This lack of control represents a huge opportunity for installers to help thousands of potential customers cut their energy bills by fitting modern, compliant controls. Having established the end-user benefits and the business opportunity for installers, let’s take a look at some of the newest developments in heating controls. There’s a lot of talk these days about ‘smart’ devices, from televisions and tablets to mobile phones. Heating controls have also got smarter in recent years and those that incorporate load or weather compensation offer a compliant solution to the 2018 Boiler Plus regulations, which is an important consideration for installers and their customers. Although typically more expensive than installing basic load or weather compensators, a smart thermostat is likely to pay for itself through reduced heating bills faster than any other technology in the regulations. Smart programmable TRVs are also available and can be fitted either as a standalone solution or as part of a zoned heating control system. Another development that is relatively new to the domestic heating market is the concept of a central controller. 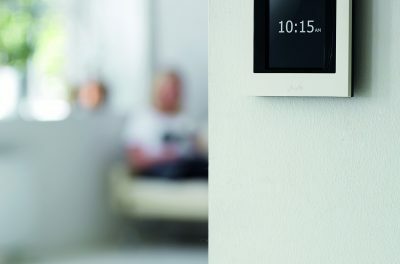 Products such as the recently launched Danfoss Link™ work by linking all the elements of a home’s heating controls, including room sensors and electronic TRVs. Ideal for larger homes or apartments, this type of system provides wireless, programmable control of radiators throughout the property, either via the central controller or by using an App. Individual room temperatures can be set, or rooms can be grouped together to create different heating zones for optimum efficiency.